The prairie summer is a chapter of the year we anticipate year round and then it flies by and is over so quickly. After learning to cultivate pinto beans with Grandpa Fred this week, our busy lil’ farm girls have had a lot prairie fun from mowing lawn with me to swimming lessons to plenty of bike riding time and playing at the “school park” with Daddy when I was canning cherries with Nana. 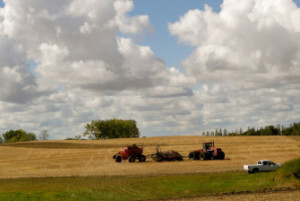 Our teenager has been farming for a week during his lone summer break before football begins in just days. 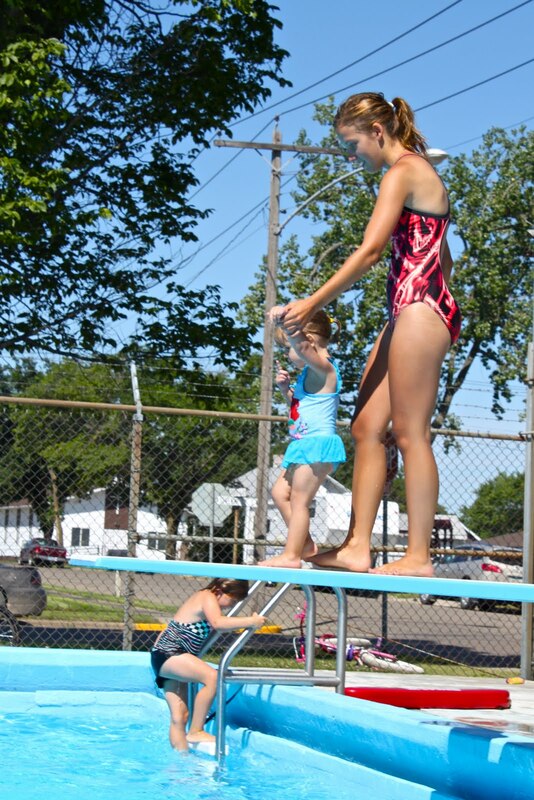 A favorite part of the prairie summer is our community swimming pool. We drive past the pool daily to go to daycare year round and there are months we see the pool full of leaves or snow. When it’s finally summer to enjoy the pool, we relish in the summer swimming fun. The teenager goes to “teen night” to swim. The girls go to lessons and often swim in the evenings with their Daddy after supper. Plus they often go with their daycare provider or me after nap time to the pool. Then, two nights a week I teach water aerobics in the pool. 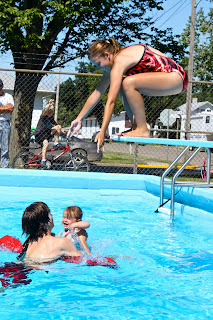 I can’t turn down a request like that and so I bring you more swimming lessons pictures. Thank you Mr. Ben for hanging on to our brave swimmer girl! 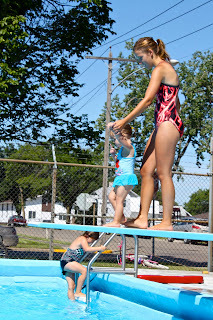 Miss A isn’t as bold on the diving board but she’s also younger and by next summer she’ll be jumping bravely off the board too. I know this as a fact because the girls are “practicing” diving board jumps in the basement next to me as I type. 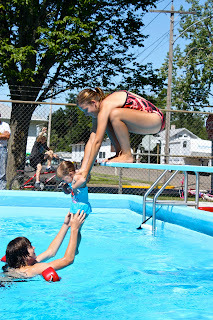 Miss A will be a “tadpole” again next summer in lessons and Miss E will be a “water frog” and those terms have Miss A saying “ribbit, ribbit” as she practices her pretend jumps today. 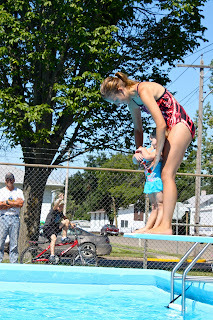 A chapter of our prairie summer is soon ending as swimming lessons are wrapped, just two more weeks of the pool being open before all the lifeguards are in college or high school and our teenager’s school year and football season begins. But we’ll drive past the pool for another 9 months, dreaming of swimming pool fun before we’ll be back next year to do it again and relish in the prairie summer. What’s your slice of summer that miss throughout the year until you can enjoy it again the next summer? What am I going to miss when summer is over? If I was at home, I’d be getting sentimental about tasseled corn, Gladiola fields, and 4-H shows. yay…tell miss e she is doing awesome! our kids have really enjoyed swimming this year and have come a long way in their skills! Get the news from the prairie delivered directly to your inbox when it's hot off the press! from my kitchen. . .